Even a person who is new to cake decorating you want your cake to look beautiful. My mother just made a cake and frosted it, she may have added sprinkles, and she wrote a happy birthday message with icing. Those were our cakes, they may not have been well decorated, but they were tasty. 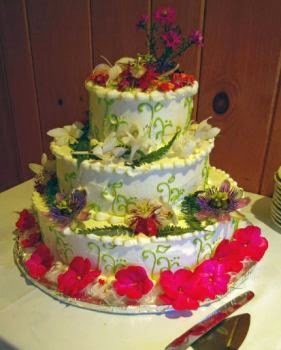 This article will give you ideas and tips to make your cake look much better than Mom used to make. When you are ready to ice the cake, you will need to hold the bag with both hands and apply steady pressure. Applying a steady pressure assures that the icing the icing will come out in an even strip. Unless you are making a long strip of piping, you should place the bag closely over the cake start squeezing and count to three, then stop squeezing and lift the tip up and away from the cake. If this decoration looks the way you want it to, move on to the next one, if it isn't quite right, keep practicing until you get it.